This is a critical distinction at a time when the Fed is contemplating not only ending its rate hike cycle - and thus curve flattening impulse - but potentially cutting rates, at least if it agrees with the market, as soon as late 2019, which in turn would prompt a sharp spike in the yield curve and, as we argued in our post explaining why the Fed is trapped, catalyze the next recession. ... Wall Street is actively hedging for what may be an economic contraction in less than 12 months. However, following the recent dramatic short squeeze in the stock market, traders once again learned a valuable lesson that bear market rallies ahead of recessions tend to be the most painful and violent ones, which is why few professional traders are engaging in wholesale shorting of the S&P as they now realize that even when they are ultimately proven right, the drawdown on their trade could be fatal, and force them to be stopped out. But if not via stocks, how are investors preparing for the economic pain that is coming next? The answer comes from Bank of America, which reveals that "one of the most popular recession hedges among rates investors is forward curve steepeners." 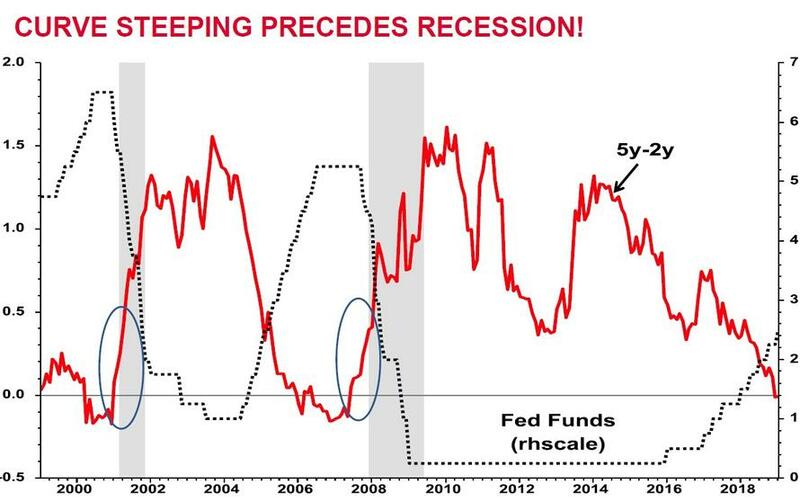 As we explained earlier this week, unlike curve flattening moves, which investors use as a leading indicator of economic downturns, a significant and sustained curve steepening move has typically coincided with past recessions. And, as BofA rates strategist Carol Zhang adds, given the increase in growth uncertainty, forward starting curve steepeners that expire within the next two years, have been one of the most popular recession hedges in the US rates market. Yet while Bank of America agrees with the general direction of the curve longer term, i.e. that a recession is coming, it notes that it disagrees with the timing of these trades (i.e., the clients is not always right), for two reasons. First, the current Fed pricing and the rates option market pricing are at odds. The OIS market currently prices the first Fed cut in 2020 (left chart below). At the same time, recession hedges, measured by the richness of receiver skews, are mostly concentrated in sub-2y expiries (right chart below). Options market pricing suggests investors have more confidence that a recession is likely to happen in the next two years, while the OIS curve only sees moderate easing. 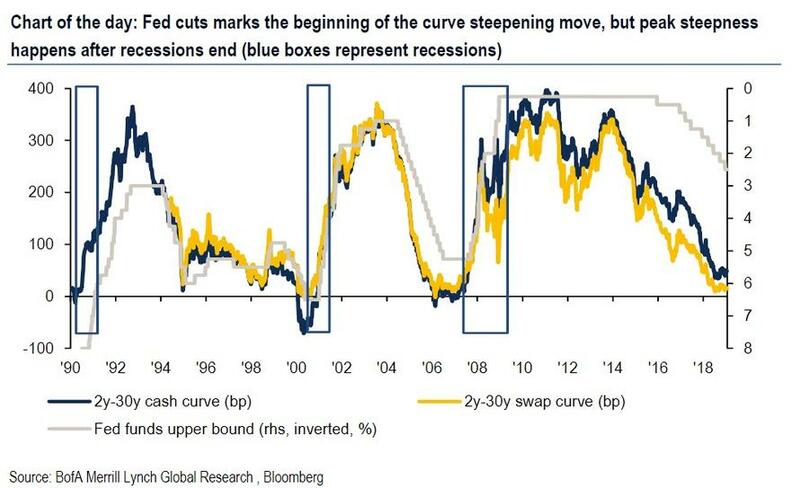 If history is a guide, the beginning of the Fed cut only marks the beginning of the structural curve steepening move. If the OIS market is correct, option investors are at the risk of missing most of the curve steepening move. If the vol market is correct, Fed cuts should be priced much earlier. 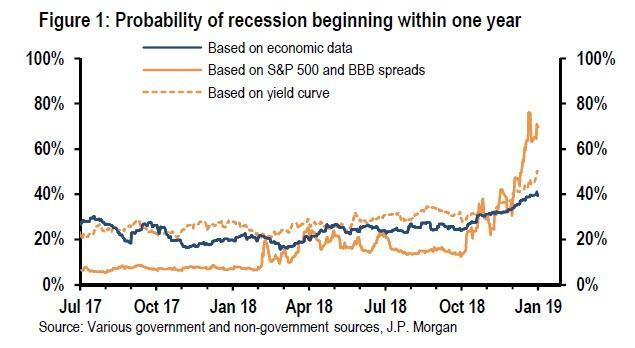 Second, in BofA's opinion, the market is "overly confident" in recession timing. The bank draws attention to several episodes in recent years when the growth outlook was questioned. Early 2015 and early 2016 saw significant Treasury market rallies due to growth concerns in relation to the oil shock and China slowdown. Both episodes turned out to be more short lived than expected, yet real rates saw much more significant decline (charts below). If real rates are correct, growth concerns may not be as severe as 2016, therefore expecting a recession to start in the next two years would be too early. If the options market is correct, real yields should have more room to rally. With these considerations in mind, BofA doubles down on its concerns about the trade's timing, noting that "it's never "if" but "when" and "how far" the curve steepens, so that investors get the most impact from these forward steepener trades." So in an attempt to dissuade clients from hedging an imminent recession, perhaps because due to the reflexivity of the market once enough traders are confident a recession is coming, it will become a self-fulfilling prophecy and a new recession would be inevitable by the action in the market itself, the bank notes that the road to a steeper curve involves three stages, triggered by i) growth expectations, ii) the Fed's reaction function, and iii) supply/demand dynamics. Like the end of prior hiking cycles, as soon as the Fed takes a pause in its hiking path, investors start to question the growth outlook, but not necessarily an immediate rate cut. As a result, the belly of the curve becomes the pivoting point, and 5s-30s curves become more volatile compared to 2s-10s as the front end is still anchored by the policy rate. This is where Bank of America believes the market currently is. The (circular) irony here, as we described in detail two weeks ago, is that the moment when the Fed starts to communicate rate cuts marks the beginning of the structural curve steepening trend; in effect the Fed's own actions trigger the market to start pricing in the recession that the Fed will be reacting against. This usually happens as growth slows significantly and requires extreme easing measures to stimulate the economy. it is possible the swap curve does not steepen immediately as front end spreads could widen significantly like the 2008 experience. Furthermore, peak steepness in the curve usually happens after the recession ends, when the Fed is close to being done with rate cuts or the economy is in early or mid-recovery stages, in other words, the first Fed cuts mark the beginning of the curve steepening move, and reflexively trigger the recession, but peak steepness happens after recessions end, as shown in the following chart. The peak steepness is also when risky assets are at cheap levels, and investors shift out of Treasuries. This, Zhang cautions, is also when supply will again become a key issue, especially in the next cycle, adding that "if the indigestion seen late last year was a preview, duration supply in the next cycle will be an even bigger problem; the ballooning budget deficit is likely here to stay, while central banks' ability to absorb supply will be increasingly limited over time. 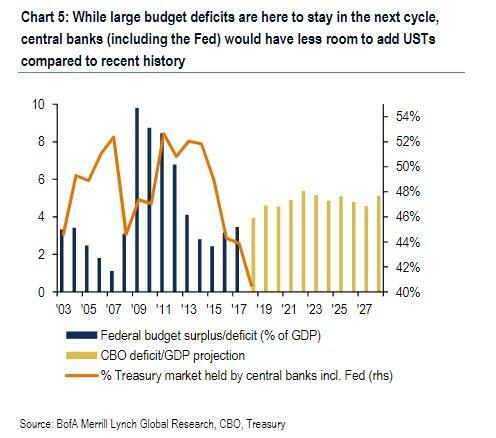 As a result, the risk is that a massive bull steepening is followed by an even most significant bear steepening due to the supply/demand issues, making the next recession an unprecedented depression, one where there will no longer be a "flight to safety" in the form of a bid for 10Y and 30Y paper. As its final point why the bank does not encourage rushing into a pre-recessionary forward steepener just yet, is that with inflation still latent, and the S&P now 14% higher than its lows hit just one month ago, it is not entirely out of the question that the Fed takes a prolonged pause instead of starting an easing cycle. Additionally, the US economy is still growing above trend according to the latest data, and the Fed needs to collect evidence that the economy is meaningfully slowing down before taking easing measures. Incidentally, there are no smoking gun trades for when the Fed is on a pause, as curve is relatively trendless then, like we saw in the mid-90s or 2015/16. As a result, instead of debating when the next recession starts and speculating on the next Fed cut, BofA recommends simply extending the expiry on the forward curve steepener to provide better risk/reward, concluding that "sometimes, it's better to be late"... unless of course all BofA's research division is doing is helping BofA's prop traders offload existing trades and find willing counterparties, and while the bank is urging its clients to prepare for a delayed recession onset and to trade accordingly, the bank's prop desk is doing just the opposite; and no, it would not be unheard of for a bank's research division to be pitching the opposite trade that its prop desk has put on: Goldman does it all the time.